In a previous episode of “Privacy Claw-back”, I deleted the contents of and removed my Facebook account. That was kind of hard to do at the time as I wasted a whole lot of time on Facebook – it was really fun reconnecting with old friends. However, I began to think critically about Facebook. This is where all of the problems come in. Facebook’s creation is a tale of amazing scale, ingenuity and engineering prowess. The dark side of the equation is the unprecedented knowledge that can be gleaned from our data about us. The impulse to use this data improperly is probably impossible to resist. Google is another can of worms. They did not become the biggest search engine for nothing. The amount of information Google has about you, your spouse, your friends, kids, your preferences, likes, dislikes, where you go, who you talk to, what might ail you, political views – it goes on and on and on. It is time for me to disconnect from Google. Can I do this and still have a positive internet experience? I hope so. I began this process over a year ago when I switched to a PAID email service, pobox.com. It works pretty good. I am fairly confident my email is not datamined, and the web UI is OK – not the best. (That is what Thunderbird is for). However, I kept my GMail accounts and Google-hosted mail service intact (but idle), just in case. For search, I switched to DuckDuckGo.com well over a year ago. It has gotten really, really good. I have found myself using Google less and less. I even changed my “urlbar keyword” search in Firefox to use DuckDuckGo. (I occasionally use Bing and Yahoo as well). Twitter is the only hold-out as I feel like Twitter is “not evil yet”. Perhaps someday Twitter will become a protocol. That, I hope, will be inevitable. Today, as I read about Google’s new non-opt-out privacy policies, it occurred to me that I really don’t rely on Google anymore, I have slowly freed myself from that dependency. I may yet have issues using certain apps on my Android device and I need to figure that out next. (Yay, Boot2Gecko!). In the meantime, I have taken this experiment up one notch by adding google.com and http://www.google.com to resolve to my local webserver in /etc/hosts – my machine can no longer reach Google or Facebook. (or Google analytics servers for that matter). The point is, there are many great internet services out there that you can rely on to handle search, email and social that don’t infringe on your privacy, try them out! When I found out I could choose my own title at Mozilla I was ecstatic. I thought about my “newbie” place at Mozilla and dredged my unconscious memory of all of the movies I had ever seen and chose the title: “Civilian Observer“. Surely you remember the 1980 movie “The Final Countdown” starring none other than Martin Sheen? (For my millennial readers, that is Charlie Sheen’s old man). His role was that of “Civilian Observer” on board the USS Nimitz. 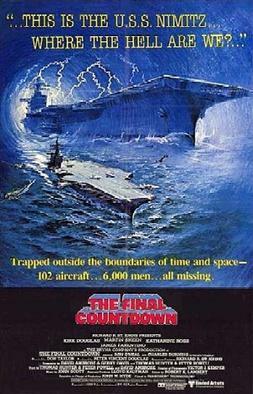 In 1980, the supercarrier USS Nimitz (CVN 68) takes on a civilian observer, Warren Lasky (Martin Sheen), at the orders of his reclusive and mysterious employer, Mr. Tideman (who helped design much of the ship), just before it departs Pearl Harbor for a training mission in the Pacific Ocean. Out in the Pacific, the ship encounters a strange storm-like vortex which disappears after the ship passes through it. Naturally, I am not going to spoil it for you, but the Civilian Observer helps try and figure out alternative ideas for the strange place the ship finds itself in. In working on open source or free software, you know there is a lot at stake. I feel like all of us are observing the growth of the internet and with it the growth of attempts at curtailing the power that this computer network gives us. We are seeing more and more of the growth of surveillance technology, some of which is created in Silicon Valley – technology that is used to prevent and record private communication, help identify and round up and torture or kill dissidents all over the world. The battle for the Web and the Internet is a full on war. It will always be that way. The issues of privacy vs. surveillance, open or closed software stacks and walled gardens are here to stay. We must be vigilant and we must create tools that fight and overturn the impulse to control or subordinate and use people and networks of people. Recently, WikiLeaks published a database of surveillance companies that produce tools that provide “Mass interception of entire populations…“. These tools deployed on a mass scale essentially turn the Internet into a surveillance system. We need more Countermeasures for this. Firefox is one of these countermeasures, without it we would really be in a world of pain. I cannot even imagine how craptastic the net would be without Firefox. Deuxdrop is another project in Mozilla labs trying to create a secure messaging system – I have high hopes for it. Again, these are the kinds of tools that need more focus. I have been working on DOMCrypt for a few years now. DOMCrypt provides a Cryptography API in web pages, making it trivial and fast to encrypt data that may be part of a message to another web user or data that should stay private while stored in LocalStorage (amoung many other use cases). I am proud to say we have implementation bugs and plans lined up for both Gecko and WebKit. The W3C is using the API as the strawman proposal for the Web Cryptography Working Group. Web developers will be able to use strong and fast crypto via a DOM API. Exciting stuff. Not sharing data with a 3rd party is the key issue. This concept destroys a lot of business models, well, one business model – the one everyone seems to think will work long term. I doubt that. Here’s a business model you can try: make a cool product and charge people a small fee to use it while simultaneously preserving their privacy. Novel, isn’t it? What can you do to help? You can demand privacy and security be a feature of the products you use, not an afterthought. You can help test or help develop “countermeasure” applications. I hope the future will bring a slew applications and startups that trumpet privacy and security enhanced applications. I hope web developers begin to think about more creative uses of their talents than online coupons and advertising-funded social media. The future of online privacy and security is both bright and bleak. Bright in that we have the CPU power, talent and base algorithms sitting right in front of us. It may seem bleak if you think no one cares about privacy or there is no ‘free lunch/free beer’ business model. Another thing you can do is support organizations that are “watching the watchers”, the EFF, Privacy International and others. A great resource for this is privacy.org. I recently dove back into the code to try and distill down an easy to use API that can be attached as a property to any DOM Window. I took the old WeaveCrypto module and created an easy to use front-end component that sticks a ‘crypt’ property on each DOM Window. While I am not sure this is ‘production system’ ready, I am sure that these are the kinds of tools the users of the web need to build secure communications applications, toolkits and libraries. Perhaps ‘Do Not Track’ can extend to ‘Do Not Datamine’?